Don’t Park in the Green Zone? Do SoCal’s waterfront developments have enough open space? Developers tout retail and creative office opportunities at shiny new coastal destinations, but where’s the green space? SOUTHERN CALIFORNIA — Anyone who has read The Log these past, oh, four-plus years has certainly noticed the amount of coverage we give to the various waterfront development proposals dotting the Southern California coast. Time-killing revitalization efforts in Dana Point, NIMBY clashes at Redondo Beach’s King Harbor and a grandiose plan to build a Space Needle-like structure on the Downtown San Diego Embarcadero are among the many waterfront projects we’ve reported on extensively. These visitor-serving amenities, of course, are restaurants, boutique shops, markets, hip office spaces and any combination of tourist attractions (such as aquariums or 500-foot high observation decks). It makes sense for developers to highlight these amenities, since restaurants, shops, markets, office spaces and tourist attractions equate to revenue – this, ultimately, is how developers will earn a return on their multimillion-dollar (and, sometimes, billion-dollar) investment. Lost in all the noise, though, are offerings of green space – or any sort of open public space, really – where patrons can just enjoy the overall scenery. This is not to say the aforementioned projects are devoid of green/open space – such land use functions have certainly been mentioned, even incorporated, during the planning process. The question, however, is whether such proposals are doing enough to balance aesthetics with business development. Developers are obviously in the business of making profits, but what is the right balance of commercialism and community? What is the government’s role, taking this one step further, in facilitating a proper ratio of business uses to green/open spaces? Let’s, in answering the commercial-to-community ratio question, take a look at what’s going on in Detroit. Yes, Detroit, which for the longest time was a city and metropolis in decline. A recent revitalization of the Detroit Riverfront should be emulated here in Southern California. Redevelopment projects spearheaded by the Port of San Diego, Orange County’s various departments, city of Long Beach, Los Angeles Harbor Department, city of Redondo Beach and Los Angeles County’s Department of Beaches and Harbors can all implement elements of Detroit’s recent riverfront revitalization. The Log witnessed this riverfront revitalization firsthand, when this writer attended the Society for Environmental Journalists annual conference in Flint, Michigan. Attendees were given the opportunity to attend one of several field excursions during the first full day of the conference. This writer chose the excursion on the re-visioning of land uses in Detroit. It was a full day adventure, with a bus full of, oh, 30-some attendees traveling from Flint to Detroit – a one-hour journey (sans traffic). Our first stop was the Detroit Riverfront, located on the southeast edge of the city’s downtown district and directly across the river from the Canadian city of Windsor. Detroit Riverfront Conservancy is a nonprofit organization tasked with establishing, improving, maintaining and operating a stretch of land on the Detroit River. The entire operation is a public-private partnership supporting the development of the riverfront district. A significant portion of the conservancy’s mission and focus is to develop the Detroit Riverfront as “an inviting destination for all.” Large swaths of lands once occupied by abandoned concrete silos have been converted into a park. The riverfront area also hosts college football tailgates, open-air markets and fundraiser soirees, among other events. There are, naturally, places for visitors to patronize, such as restaurants, shops, aquariums and botanic gardens. Yet the riverfront revitalization is not disproportionately commercial. A balance is struck between large open spaces and accessible commercialism. Waterfront revitalization plans in San Diego, Orange County and Los Angeles metro have not prioritized green/open spaces, based on what various developers have proposed, recently. Plans to provide ample green or open space were rarely touted in CenterCal’s recently failed attempt to revitalize the King Harbor area in Redondo Beach, for example. The Waterfront project was consistently presented as a place where people could enjoy a dinner, watch a movie and do some shopping. A similar CenterCal project across from Alamitos Bay Marina in Long Beach, which is currently being built, is purely commercial and absent of any green space. 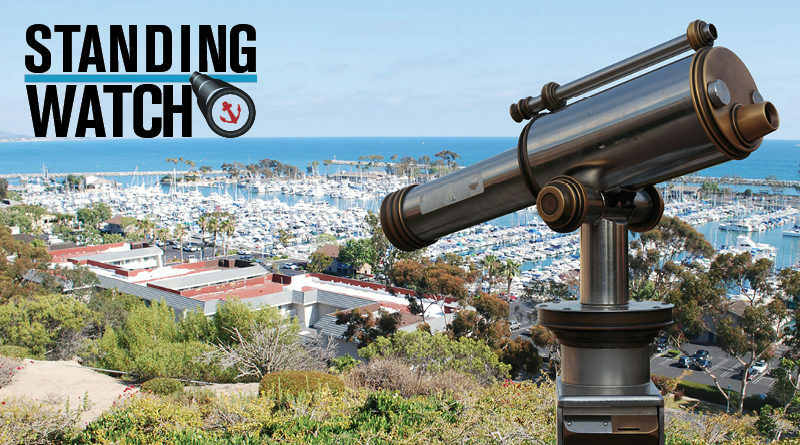 The ongoing attempt to revitalize Dana Point Harbor has consistently focused on three things: parking, landside commercial improvements and boating interests. A dedicated green or open space has not been boasted by the harbor’s revitalization plans, which are currently being reworked. It’s also unclear whether a new hotel project at the eastern tip of Harbor Islands in San Diego would feature a dedicated park or other form of green space. Projects along San Diego’s downtown embarcadero and Chula Vista Bayfront, meanwhile, do appear to have open green spaces included within their respective plans, though developers and planners behind both revitalizations have consistently emphasized large-scale commercial efforts associated with each redevelopment. A 1,600-room hotel and large convention center headlines almost every mention of the Chula Vista Bayfront redevelopment, while those behind San Diego’s Seaport Village regularly remind folks of plans to build an aquarium and high-rise observation deck. Los Angeles might be the one ray of hope here, what with the city’s plans to provide a community park with unobstructed water views at the proposed Wilmington Waterfront (part of the larger L.A. Waterfront revitalization). The proposed green space in Wilmington complements the planned commercial overhaul of neighboring San Pedro’s waterfront, where new restaurants and shops will abut local marinas. ← Does California care about anglers and boaters? The lack of balance between commercial elements and open space, though, is noticeably and consistently lacking in Southern California’s proposed waterfront revitalizations. Waterfront property in Southern California, to be sure, is expensive – especially when compared to Detroit. The high cost of land in the L.A.-O.C.-San Diego region certainly provides incentive to maximize as much revenue from waterfront-adjacent land as possible. This, however, does not mean lessons can’t be learned from Detroit. How can waterfront revitalization plans embrace the mission and vision of the Detroit Riverfront Conservancy while still building commercial elements for revenue creation? Contact these policymakers and developers below and let your opinions or perspectives be known.